Proper glassware, Pfriem, TRVE, CAH, and … yeah, not sure what the frypan was doing there, but you can blame our insatiable need for bacon. Welcome back to this weekly feature, which got skipped last week due to a deadly combination of not enough people sending in items, and too many other stories clogging up the queue. 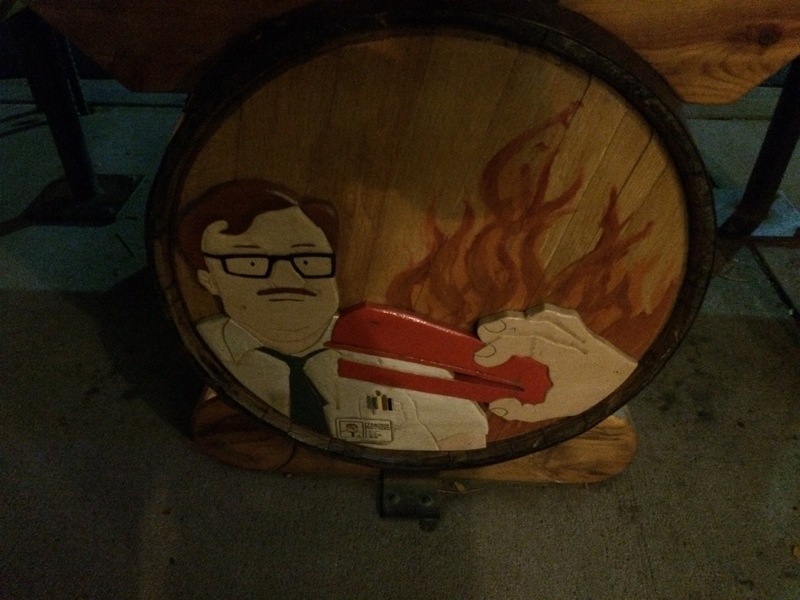 This past weekend, however, was a lot more jam-packed with beer-related fun for most of us. Huzzah to that! For me (Stoutmeister), it was a chance to catch up with friends in the film industry who actually got a weekend off. There were beers to be consumed, ridiculous food to eat, and, naturally, a round of Cards Against Humanity was in the, um, cards. On the beer front, folks cleaned out some oldies but goodies. 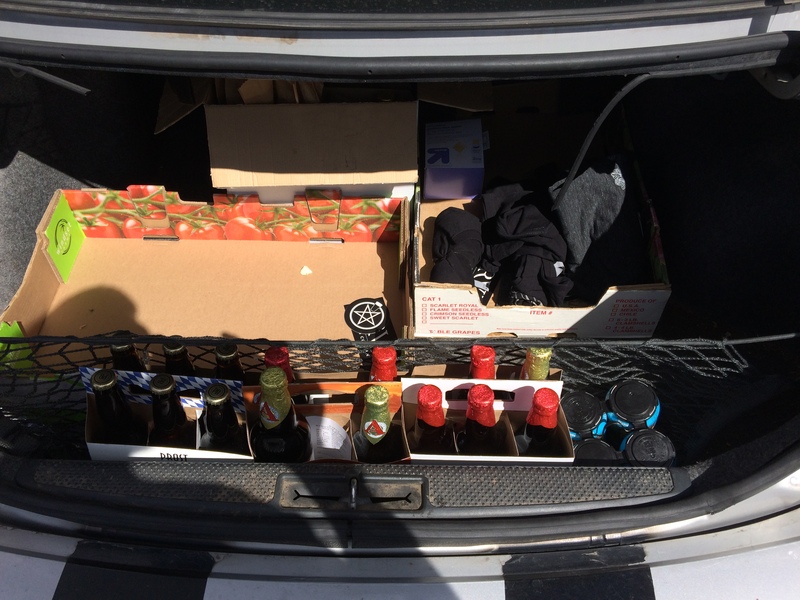 We had beers from Trinity Brewing (Colorado Springs), TRVE Brewing (Denver), pre-evil-empire Wicked Weed (Asheville, NC), Pfriem (Hood River, OR), and one lunatic stout known as the Truffledome from California. For a few other beers, we did a little mixology. Using Santa Fe’s Chicken Killer as a base, we tested it out with some Oak Aged Vanilla Worldwide Stout from Dogfish Head, and the blend was a beauty, as it took away some of the CK burn as well as keeping the Worldwide from being overly sweet. Hey, if the folks at the SFBC taprooms can make some mixes, we can, too. Denver called. Franz Solo and Stoutmeister answered. We were somewhere around Wagon Mound, on the edge of the northern plains, when the bugs began to take hold. No seriously, these were a veritable swarm of all sorts of insectoids smashing and crashing against the car. Wait until you see the goddamn locusts! 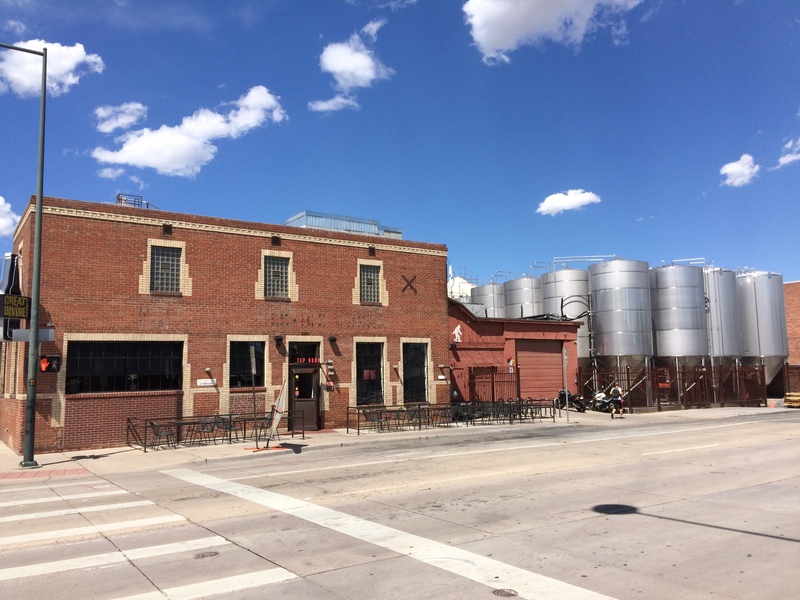 But I digress, it was a warm sunny day when Stoutmeister and I set out to the grand city of Denver to seek our fortunes in the plethora of outstanding brews to be found there and bang our heads to some absolutely amazing Finnish melodic death metal. They have a sense of old-school humor at Trinity in Colorado Springs. We stopped in Colorado Springs to get some much needed sustenance and sample a brew or two at Trinity Brewing for some delicious sliders and epic mac n cheese while sipping on an outstanding coffee stout. Those who love sours and saison would have a field day at this joint, for those of us who had just drove five hours at top speed, we needed sustenance and coffee-infused beer to finish the drive to Denver! Once we arrived in the city proper, our accommodations were stupendous, and we were whisked away to the Atomic Cowboy, a top-notch beer bar on Colfax, where we imbibed several local brews, some as a preview of what was to come and others which were welcome new beers to our palates. Lunch at Wynkoop. Don’t panic, we had food, too. 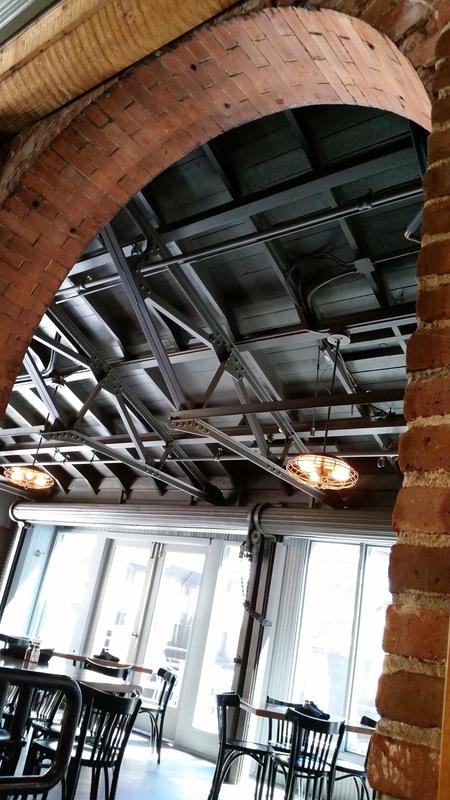 The architecture of the Wynkoop building was rather impressive. 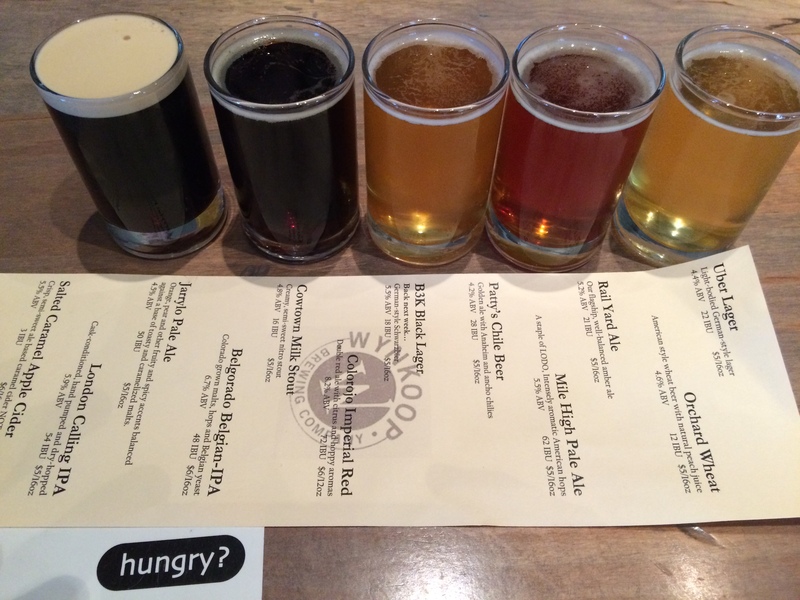 The following morning we trekked to Wynkoop Brewing for an early lunch. 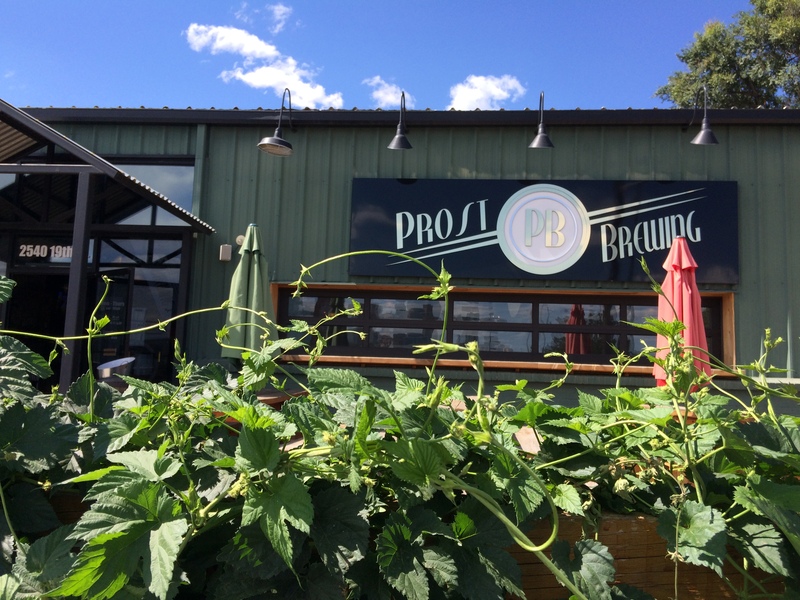 The brews were average, but we were there for the food and the ambiance, which were excellent. I took a bit of a walk through the basement and was greeted with the requisite aging and barrel room. 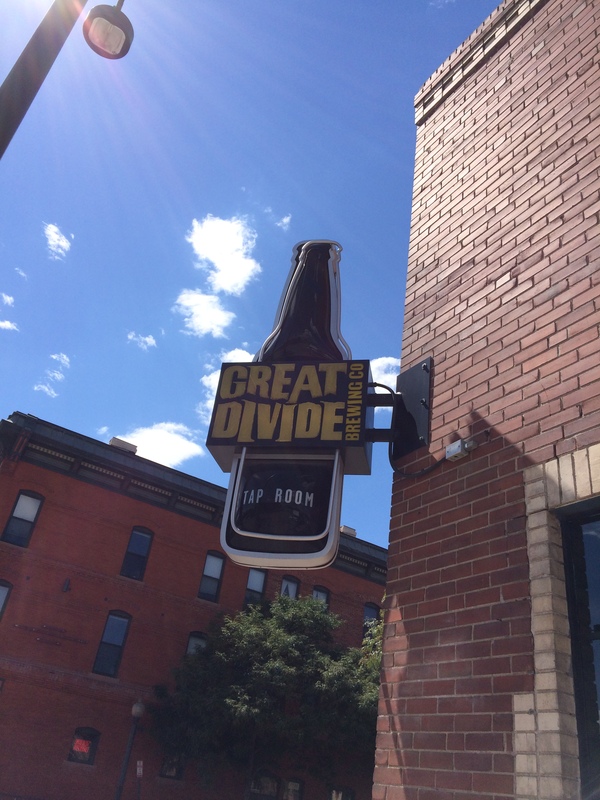 The mothership that is Great Divide. The elusive Yeti, and friends. We then trekked our way over to Great Divide in search of the elusive Yeti. Our arrival was badly timed, at least musically, for we were wearing our Pantera and Iron Maiden shirts and the tune playing in the joint was anything but metal. 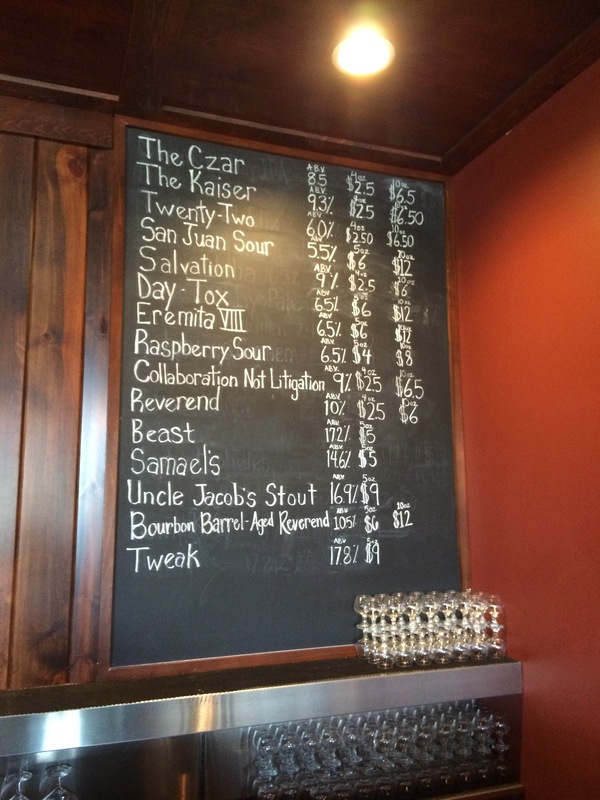 The bartender jokingly greeted us with “the metal brewery is just down the road,” referring of course to TRVE Brewing, which incidentally enough was on the list for the day’s adventures. We settled in for a veritable smorgasbord of delightful samples including Claymore, Hercules (which I have previously reviewed and was just wonderful on tap), as well as of course the inimitable Yeti. A little slice of Germany in the heart of Denver. Now that is a sampler tray. Our palates whetted, our coffers filled we made our way to a little slice of Deutschland in the heart of Denver. Ever since my wife made her way to Prost, she raved at how I would adore them and she was not wrong in the slightest. Prost is as damn near to drinking German brews as one can get outside of being in Germany itself, as far as I’m concerned (one day that holy pilgrimage to Munich must be made), and we absolutely loved their beer and everything else about the place. 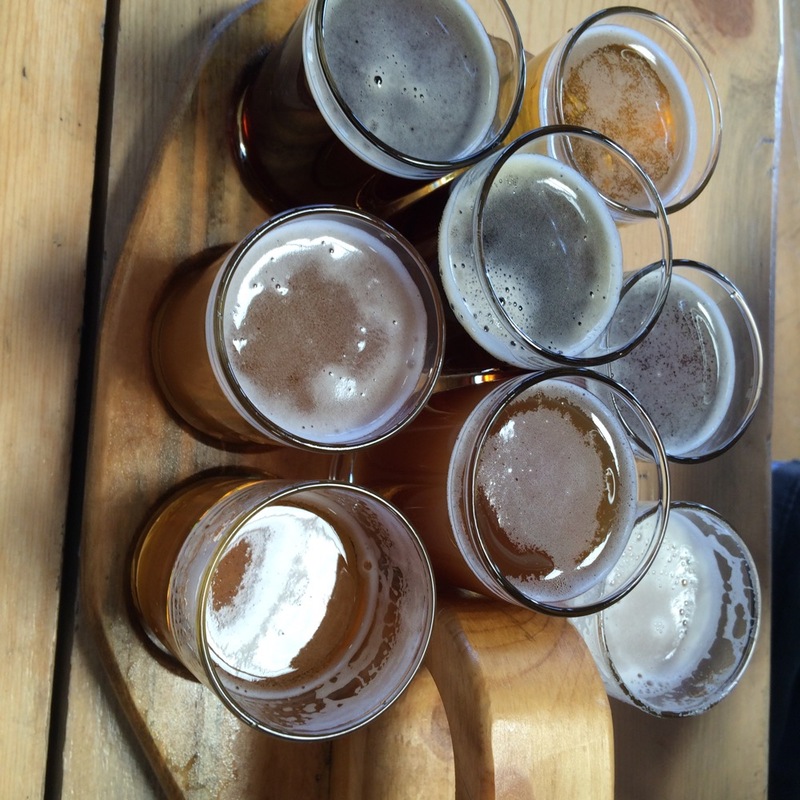 Particular favorites of mine were the now GABF gold medal-winning Weißbier and the exceptional Keller Pils. Were I a resident of fair Denver it would be safe to call this an often frequented joint for the beer and the atmosphere alike. Our German palates whetted, our loot of barrel-aged Doppelbock stowed, we set off to black metal heaven in the aforementioned TRVE Brewing. Our arrival, as it turns out, was badly timed. Or at least we had a bit of time to kill before the joint opened for the day so we went for a short stroll down the block and back. The shops around TRVE are a testament to the intriguing melange of culture growing in Denver and Colorado proper. You have high-end retail and fine dining next to dispensaries, cross fit, yoga, and adult shops. What to make of this blend? Time will tell. Oh, glorious flight of TRVE brews. 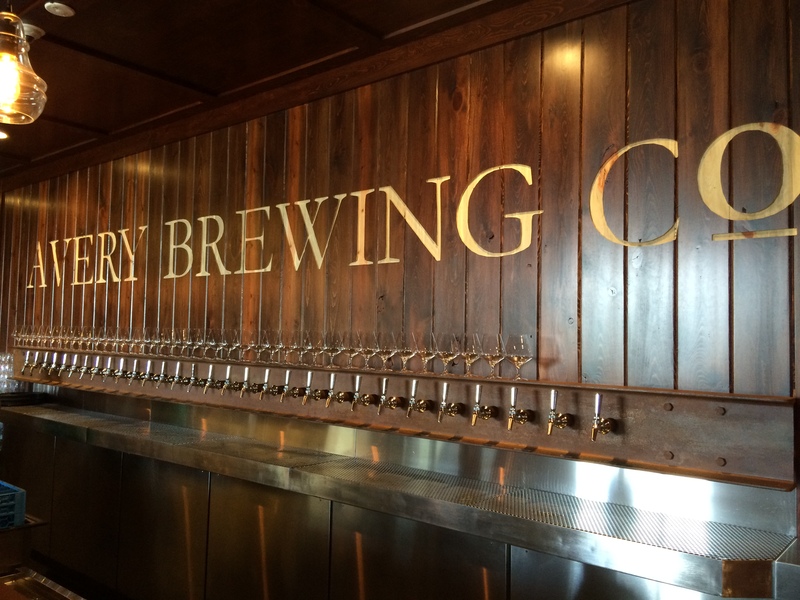 We were the first inside TRVE as the doors opened and this brewery was everything we had been told it would be. 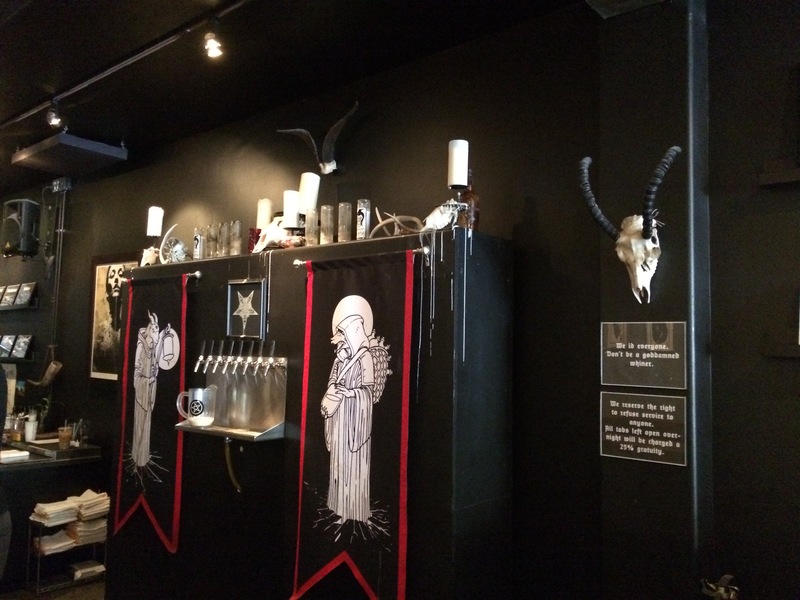 A medieval long table commands the hall, the walls bedecked with black metal inspired art, and the altar of Baphomet, which also houses the taps, is stunning to say the least. Of all the places to prepare for a Finnish melodic death metal show this was TRVEly the ticket! The beer was as excellent as the metal music filling the place was well, metal. Our particular favorites were Tunnel of Trees IPA and the delightful Stout O))). This really felt like home to me and I would love to have a metal-themed brewery closer to home, although it is likely I would never want to leave. We want to come back for some Saturday footy on the telly. We did, however, have a show to get to and required sustenance prior to the event. 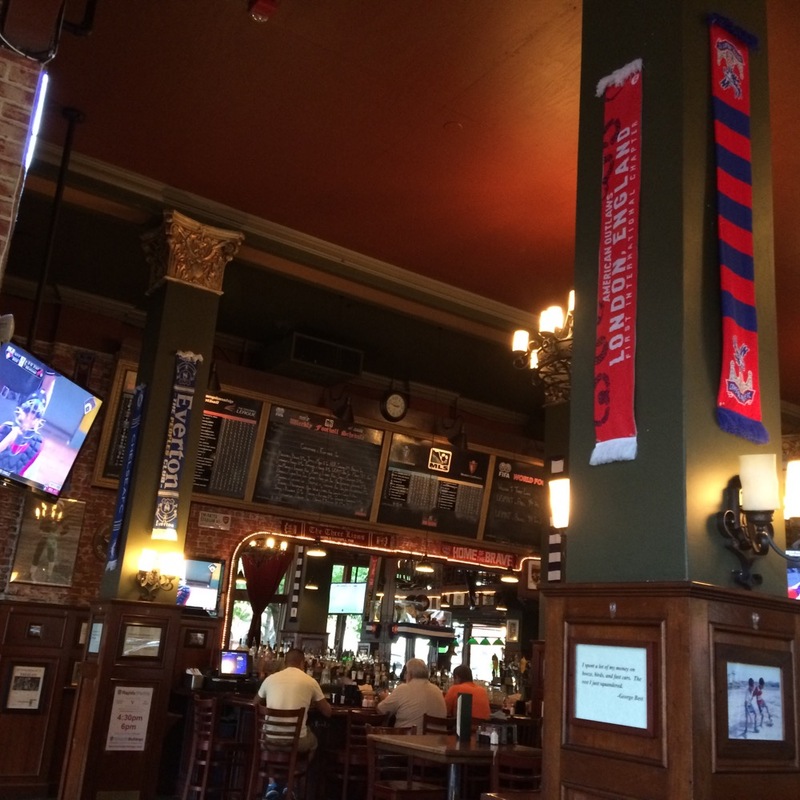 The Three Lions proved to be an excellent choice indeed and we would be quite lucky to catch a game or two of English Premier League, or most any other sport in the joint on a busy weekend. The glory of metal was bestowed upon us. Our show at the Bluebird Theater was a night to remember. 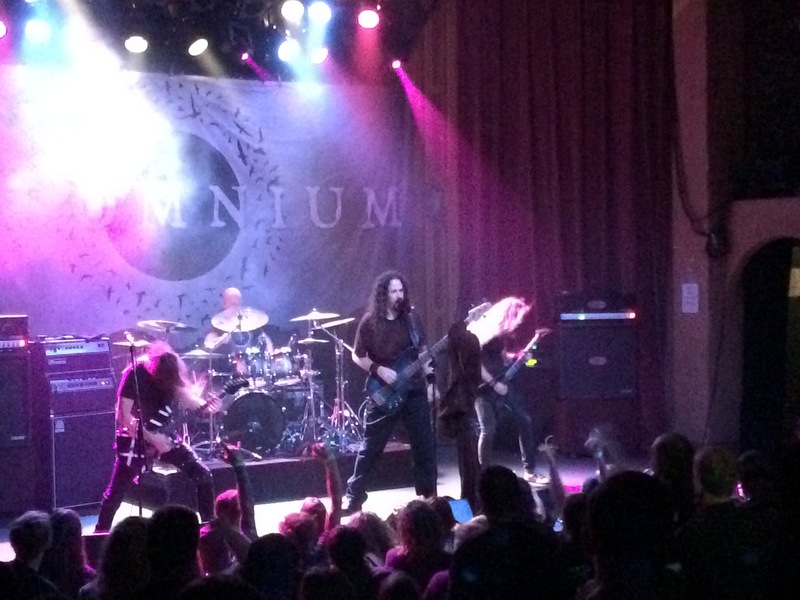 The local openers Solar Flare set the tone and Omnium Gatherum and Insomnium put on a pair of stunning sets that set our hearts aflame with some rousingly grand metal. This isn’t heaven, but it’s close. We awoke the following day and set out for the great Avery in search of glory, and glory found us as well. For those of us who had been up all night head-banging to metal, we were in no mood for coffee and doughnuts, we needed strong drink, or at least a little slice of Valhalla to tide us over. 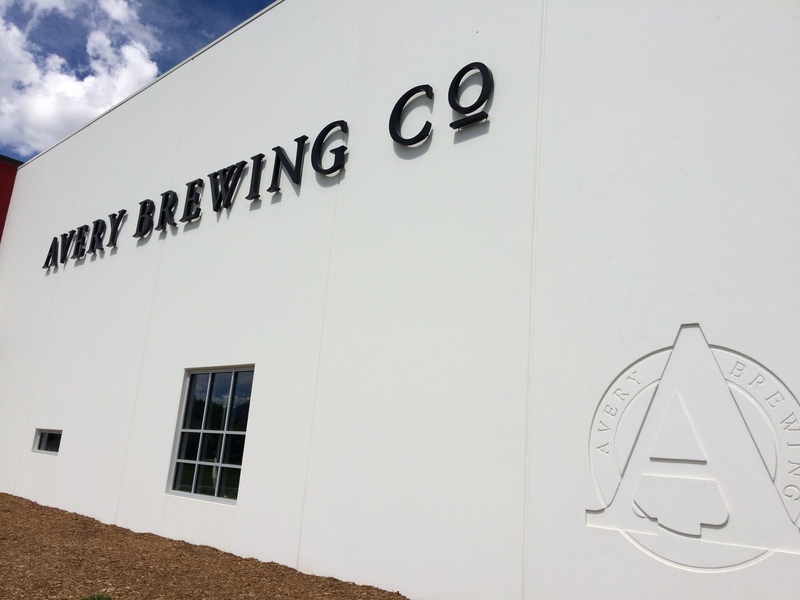 The new Avery headquarters is simply jaw dropping. 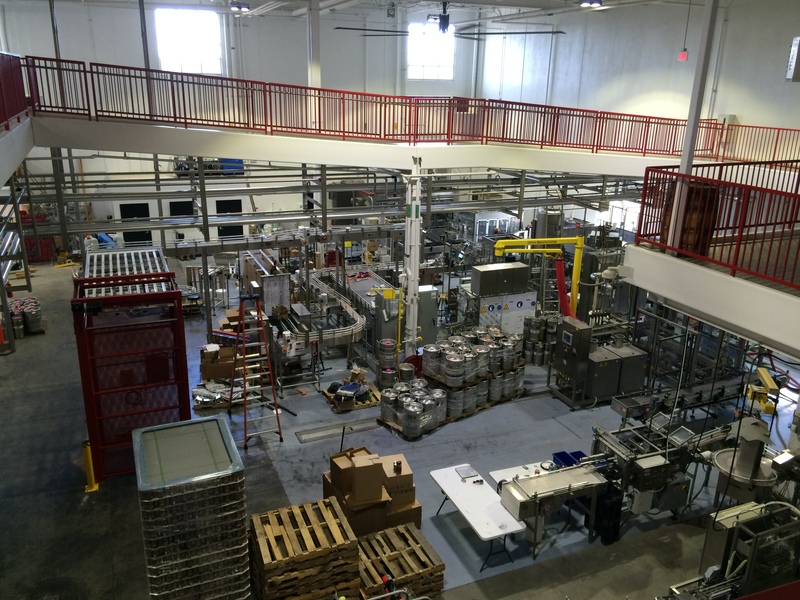 An enormous building, for starters, with a pair of taprooms and a modern brewing facility that would make many in the industry quite jealous. 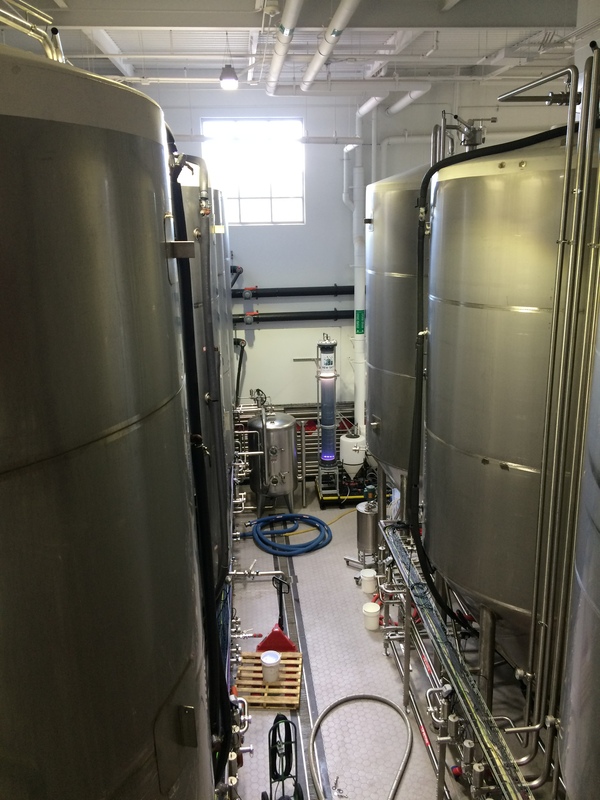 We were like a couple of giddy kids making our way to wonderland and the anticipation was met with some of the hands-down best beers I have ever had the pleasure of tasting from the source. Having enjoyed many of Avery’s offerings over the past decade or so, we stuck to some of the brewery exclusive options with such delectable choices as Gored (a splendid pumpkin beer), Out of Mind coffee stout, and Raja IPA (here’s hoping we get a few of these in Albuquerque!). 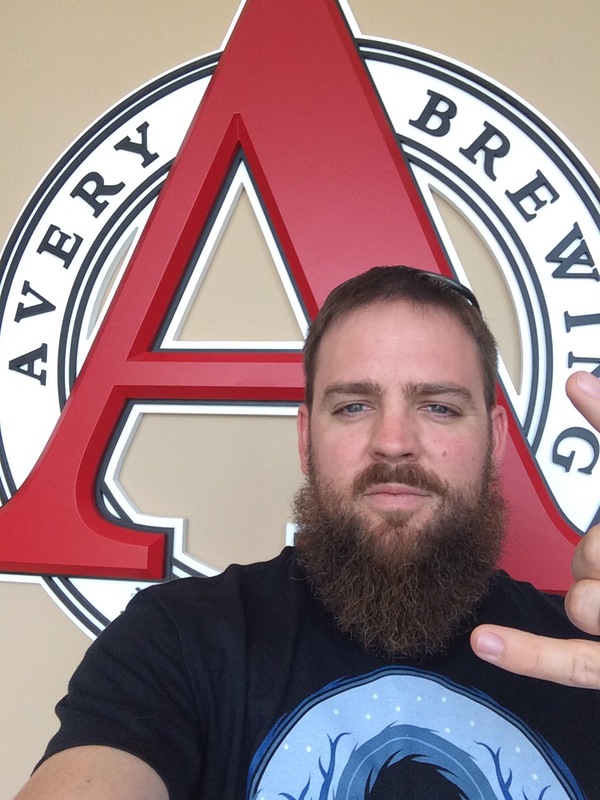 The ridiculous lineup of Avery beers, many only on tap at the brewery. The food offerings were definitely on par with the quality of the beer, a menu fit for a king to be sure. Being that we are indeed the Dark Side Brew Crew, we were well prepared for such powerful brews as the Reverend (standard and barrel aged), Samael’s, The Beast (a particular favorite of mine from the days when you could procure bombers of the behemoth), and of course Uncle Jacob’s and Tweak. To say our palates were in heaven is the truth, nothing less, nothing more. 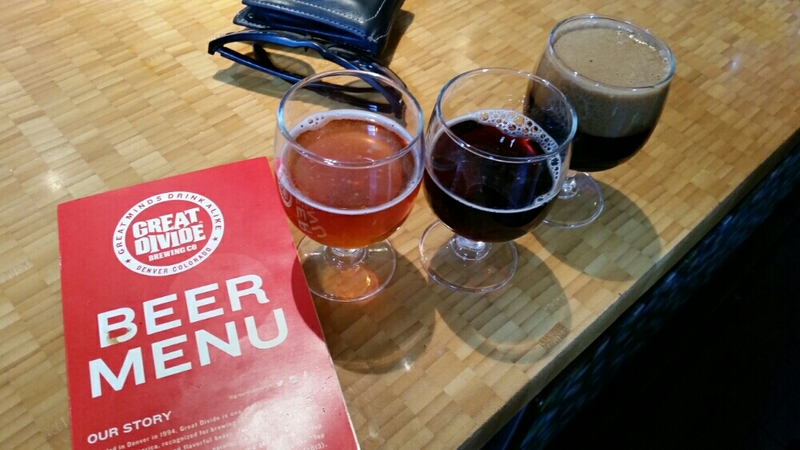 We were properly prepared for our self-guided brewery tour. A snifter of Jacobs and Tweak in hand, we wandered through the sections of the brewery proper that were open to us and basked in the glory of being at the source for so many wonderful creations. A packaging line for the ages. Tanks as far as the eye could see. 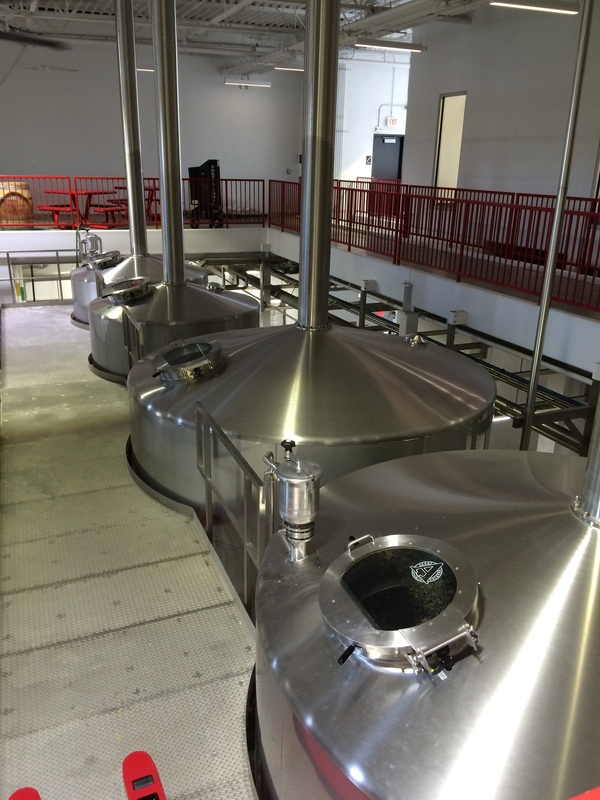 Dear lord, now that is a brewhouse. Alas, all good things … well we brought just a few souvenirs home … must eventually come to an end. We made the grueling drive through rush hour hell to the high speed burn from Raton to the edge of Santa Fe (our insectoid friends returned, with rain to boot) and found our way back to safety and security in our homes at last, just another couple of freaks in the freak kingdom of fair ‘Burque. That should tide us over for a little while, right? Until the next grand adventure we bid you keep the metal loud and the beer exceptional. Stoutmeister here. Porter Pounder went up to Denver in between movie gigs, or possibly on his days off, the rest of us are never quite sure. 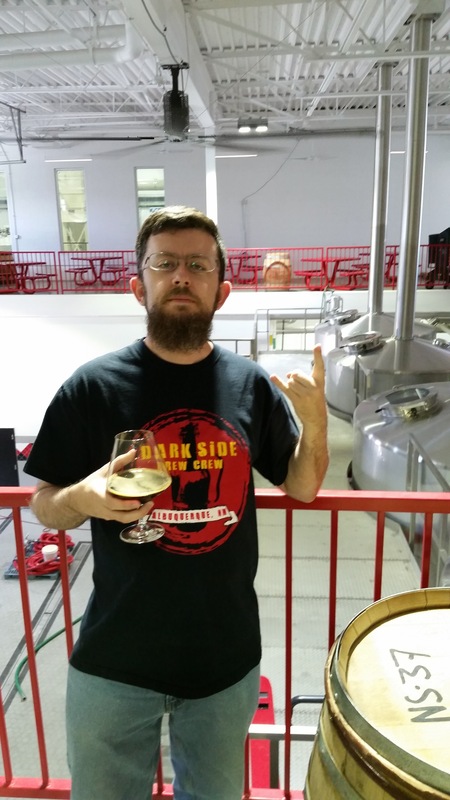 Either way, while there he discovered a fairly new brewery that taps into our group’s metal-loving souls. 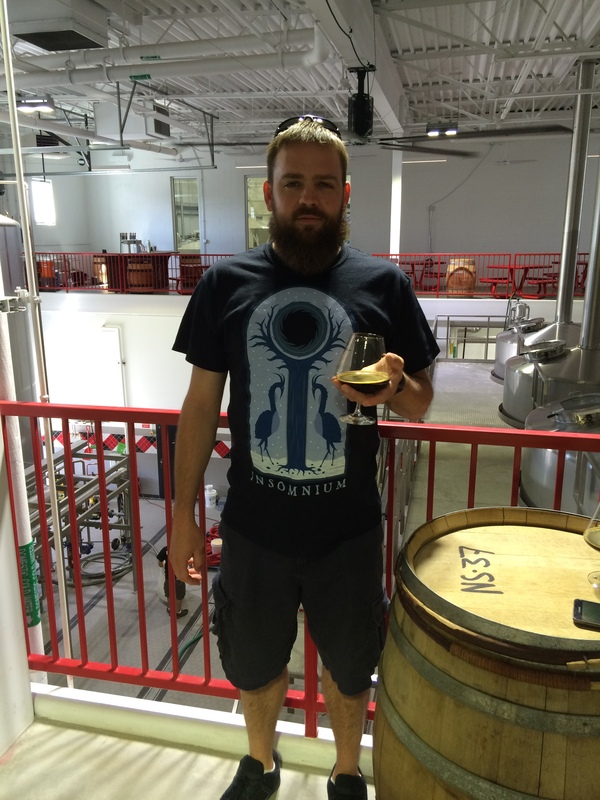 Now that he has another brief break in filming, he sent in his review of TRVE Brewing. TRVE Brewing has barely been open for a little over a year. It is a metalhead’s haven of amazing beer, good music, and brutal artwork lining the walls, which is on a constant rotation of artists. Most of their beers are named after metal bands’ songs or namesakes. The best part of this brewery is the crowd. It’s clearly people of all styles of wardrobe and musical preferences who join in the name of phenomenal beer. 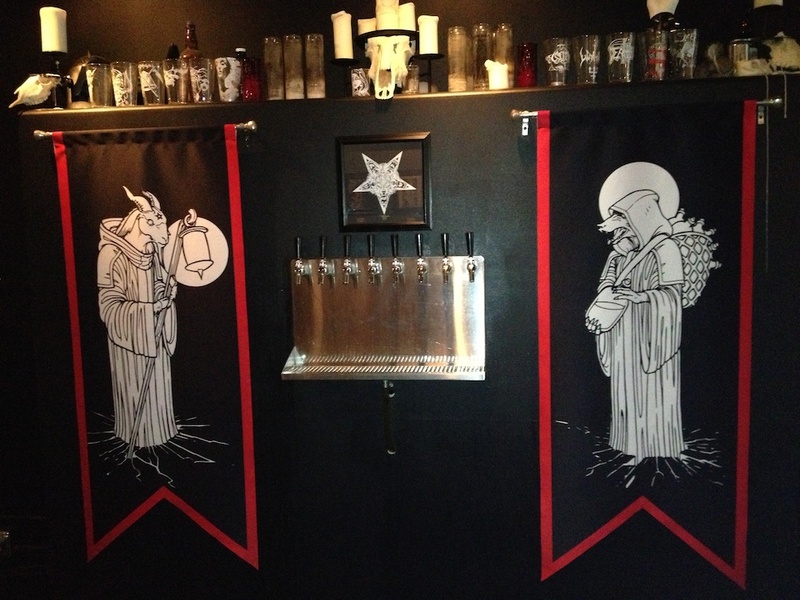 Metalheads opened a brewery and decorated it accordingly. 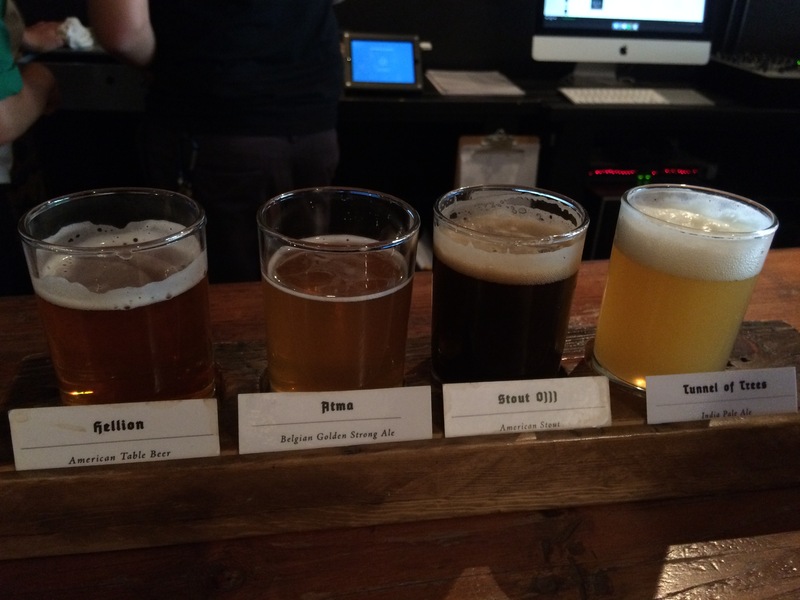 Here is a beer-by-beer review of what TRVE Brewing had on tap when I visited in June. A big thanks to bartenders Jason and Wil for their guidance in my journey. From left to right, the Hellion, TRVE Brewing Vol. I, Death Ripper and ATMA. ATMA (Belgian Strong): The Belgian yeast is strong in this one. The citrus provides a palate cleanser after you get a wave of really well-balanced wheat and yeast. This is technically lighter than many Belgian strongs I’ve had in the past, even at that 8-percent ABV. 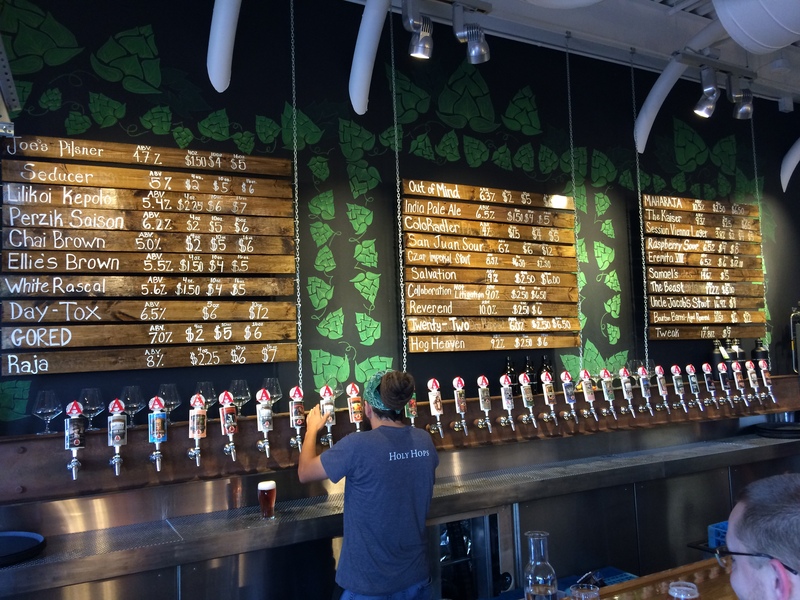 While I was there the Nazareth (Double IPA, 10% ABV) just went off tap and was replaced with the ATMA, and the Prehistoric Dog was pints away from being replaced with their new Black Cascade. Well, my friends, I’m off to bathe in goat’s blood in the forest, guiding my way through the dark treacherous path by flaming swords. I recommend you do the same! P.S. I came back and tried the new Black Cascade (Black American Ale, 6.6% ABV) as it went on tap finally. This is a bold change. Easily one of the most robust in all-around flavor. This beer packs a punch in hops and will creep up on you in alcohol content. Very pungent off the top of your tongue through washing down your throat, this is an IPA fan’s delight. For being a non-IPA fan myself, I’m sold.